Here we are, nearly at the end of August, and that summer whirlwind of sport … Wimbledon, the World Cup, Athletics, not forgetting Le Tour de France (well done Geraint! ), has slipped by almost as quickly as the lovely weather that marked these sporting events. 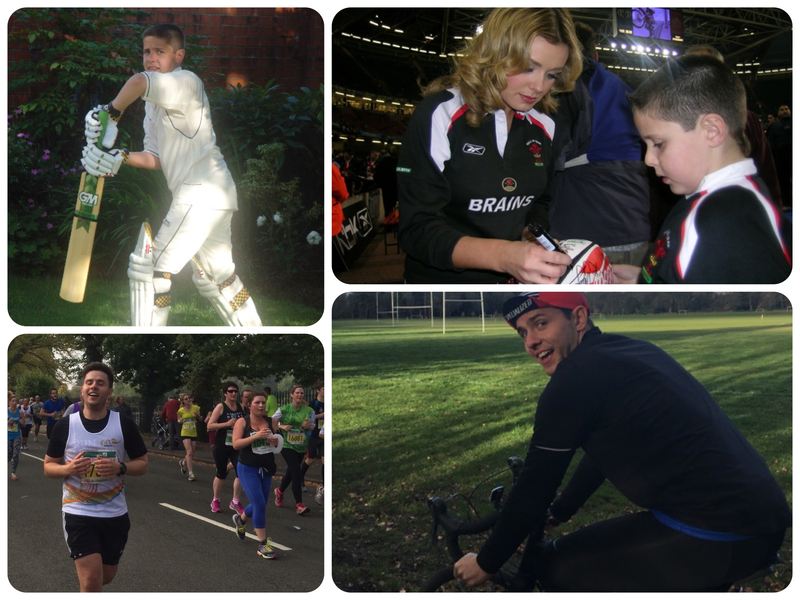 In our family, sport has always played a big part in family life. Dad was pretty good at Gaelic football and Hurling. He is also a big Rugby fan, enjoys a competitive game of Golf and is not too bad at rolling the balls down a skittle alley or his bowls down the bowling green. Just be careful you don’t read this last sentence after you’ve had a glass of wine, otherwise, the text might take on a different connotation! My sisters were keen baseball players, and my Mum loved nothing more than spending a summer evening in the local park watching the girls play baseball; and in the autumn and winter months, with my Dad, watching my Brother-in-law playing rugby for Cardiff. Infact, Mum loved all kinds of sport, and could often be found shouting at the TV in encouragement and/or frustration at televised sporting events. Me? I like Athletics, but I’m not so interested in all sport. Apart from school sports day, way back when I was in Primary education, there wasn’t much opportunity to develop sporting skills in a Special Ed school. I’m glad to say things have changed now, but I have two claims to fame on the school sporting front … being a doughnut eating champion and a winner of the electric wheelchair slalom on several occasions. I was never much into water, and nearly drowned in a swimming pool when I was about eleven, and, if I can help it, the closest I get to water is a shower. I’m not too bad on a cross-channel ferry but, heaven knows how I managed our first cruise – it must have been the drinks package, but that story is for another day. When this year’s World Cup started Steve reminisced about his childhood experiences in sport. Kicking footballs and rugby balls up and down the garden was, apparently his staple exercise when he was in primary school. He liked table tennis, and was, by all accounts, pretty good at it. He tried badminton, swimming and horse riding, but was never destined to be either a “Jonnie” or an “Oscar”. It’s probably just as well he didn’t aspire to become an Oscar, but he does have a certain “Peacock envy” over the “Strictly” appearance last year … sad boy! But, back to the World Cup. Having been forced to watch all of the England games, I was also subjected to a blow by blow account of Steve’s recollections of World cups of yesteryear; told in great detail of the 1970 World Cup; the sticker collections and, how for most boys growing up in the 1970’s, Bobby Moore was their International idol. For us, the World Cup of 1998 heralded a new era. This was the summer when James got his first bed and marked his progression from toddler to child. The bed came with a duvet cover which was themed France ’98. James loved that duvet set and, of course, the summer of ’98 was punctuated with World Cup clothing. James’ end of nursery school photograph, saw him proudly sporting the cutest pair of denim dungarees and his World Cup ’98 trainers – which, if he’d been able to, he would have worn to bed. His first sporting love was football. It is probably no surprise (as a child of the 1990’s) that his sporting hero was David Beckham and his favourite football team, Manchester United. He has a collection of sporting memorabilia which has been acquired over the years, but the first piece was a football, signed by the Manchester United team of 1999, who won the treble for the Club. School sports days were a rather hit and miss affair. They were usually either postponed by weather or marked by a letter home from school warning against video filming the proceedings. They were (and I think that to be the case for the majority of parents) events to be loathed rather than relished. James had quickly grasped the nettle that neither Mum nor Dad was going to enter the parents’ races, and so contented himself with taking part in the class or house races with gusto. He absolutely loved the obstacle race, which usually entailed putting on or peeling off layers of clothes as he went down the track before reaching the finish line. The only problem was, as he had been taught to fold his clothes at home, he would stop … take off his jumper, very carefully fold it up and put it neatly on the ground and so on – I think you will see where I am going with this one. Needless to say, the rest of the competitors had long completed the race before he crossed the finish line wearing the biggest and broadest smile and being cheered on by parents and friends. Of course, the actual school playing field presented its own issues for mobility challenged parents. School chairs are usually brought out from classrooms, and understandably, the chairs are designed for tiny people. Now, for most people who know Steve and I, they will know that try as we might, arriving early at any event does not figure on our radar, no matter how hard we try, and sports days were no exception. Work usually meant that Steve was running late, and so we would arrive in school just in time for the start of the first race. In fairness to the school, there was always a chair for Steve to sit on but picture this scenario. Man in suit and tie sits on a chair with tubular legs. The ground is damp from rain the previous day. The chair on which man is sitting sinks into the ground. Man has to be rescued by parents and staff. Man huffs and puffs back to the car, which has been driven onto the playing field. Man drives into a soft portion of grass. Car gets stuck. Man tries the trusted method of getting car out of mud with a car mat. Man fails. Parents come to the rescue … again. Man presses the accelerator. Parent (a very helpful Mum) helping to push the car gets covered in mud. Man in foul mood for the rest of the day! The Saturday morning football sessions were also a bit of a challenge. Cold autumn and winter morning visits to the local astroturf site, saw Steve and James trundle off with a flask of hot coffee and the Saturday paper. As soon as it becomes clear that standing around for over an hour was not going to be feasible, Steve cracked that one by arriving early enough to park where James could see his Dad, Steve could see what was going on, and by the time they got home, the coffee had been drunk, and the weekend TV magazine had been read from cover to cover. Then there was the Rugby and Karate phase, closely followed by tennis, with a smattering of cricket just for good measure. My Dad obliged on the rugby sessions. South Wales is not renowned for having wonderfully accessible rugby grounds … I wonder why! In all honesty, this rite of passage was good fun, but I think the high spot of James’ love of sport had to be in 2005. The Autumn rugby international tournaments saw Wales play Australia at the Millennium Stadium in Cardiff, and James was chosen to be the Welsh mascot. He was kitted out with the national strip and was able to meet and greet all the Welsh team, and many Australian players – including their team coach … a certain Eddie Jones – who didn’t seem quite as vocal about Welsh rugby then, as he has been during his tenure as coach of the English national squad. We were lucky enough to be pitch-side during the warm-up and met the wonderful late Ray Gravelle, and Katherine Jenkins – our homegrown classical singing diva. Now it is fair to say that most middle-aged men, who have any appreciation of classical music, may (at some stage) have had a kind of crush on Ms. Jenkins, and that was true of my better half. Father and son lined up for the fashionable two-cheek kiss, but son came off best … Father was completely overlooked in the kissing stakes, and he has never quite recovered from that snub! The up-side was that Wales beat the Australians for the first time in 22 years and for that reason, this sojourn into the world of sport will go down in Moriarty-Simmonds folklore. The 2012 London Olympic Games was iconic on many levels. Perhaps not best remembered for the lottery system which saw many homes going into meltdown in the scrabble to secure tickets, but for us, all the research, calculating and form filling by yours truly, worked and we did rather well. We were lucky in the lottery for both the Olympics and Paralympics. We witnessed the continued rise of Usain Bolt as one of the most extraordinary athletes in sporting history and saw the sporting demise of Oscar Pistorius against the rise of our very own Jonnie Peacock and other well deserved successes in both Games. I guess the downside to the Paralympics games concept, is the exclusion of people with learning difficulties. Whilst I applaud the Special Olympics International movement, wearing my equality hat, I long for the day that there is a recognition that elite athletes have diverse impairments, and true inclusion will only really exist, when all levels of ability and impairment, compete on (please excuse the pun) a level playing field. And now back to the here and now. Sporting successes can be short-lived. I shall simply say “Sir Bradley…” Bradley who? I hear you say. That fate may well befall our very own two-wheeled champion Geraint Thomas, who has already had a velodrome named after him, as well as having a freshly painted mural of the great man himself adorning one of the buildings at his old training ground. But I sincerely hope not. Across the country there are thousands of Mums and Dads, without recognition or otherwise, washing kit, shouting on the sidelines and organising amateur teams in all kinds of sporting disciplines, just so those various sporting dreams, may be given an opportunity of turning in to the reality of achieving sporting success. We only see the tip of the iceberg, when we see glamorous sporting spectacles on TV; and if I’m totally honest, the world of sport would be nothing without those selfless, hardworking and committed people, who turn out week after week to nurture those secretly held dreams. A strange object called a Thule bike rack appeared on the top of James’ car yesterday. Seemingly, there appears to be a desire to peddle through France at a rate of knots, in the hope that he too will one day cycle down the Champs-Élysées wearing a rather fetching yellow T-shirt. However, word of caution … on the strength of school sports days, we may be waiting a while!